Saturday morning and I was to be, ‘Photographer’ for the day! My parents friend’s daughter, was getting married today and I had been asked to do the photography. My Daughter was assisting me, but we had to dig deep to find our enthusiasm, as the weather, was horrid! The air was full of drizzle. This was a potential disaster as the Bride & Groom had set their hearts on getting married outside. We arrived at the Venue, nice and early, loaded with our gear (3 very large white umbrellas in tow!) both looking very professional. We introduced ourselves to the Wedding Party and started to snap away as the guests began to arrive. The bride looked beautiful! The pageboys and flower girls were adorable. They ranged from 1 to 6 years old and were impeccably behaved. The rain withdrew to a mild drizzle so the decision was made to hold the Ceremony outside in the purpose built Gazebo. The guests were seated, the Ceremony began and everything went without a hitch! The service was short and sweet and it was soon down to business! I keep group and posed photography to an absolute minimum! Obviously though, Parents & Grandparents require the odd traditional shot so we snap away and group together as quickly as possible without making anyone feel too rushed! 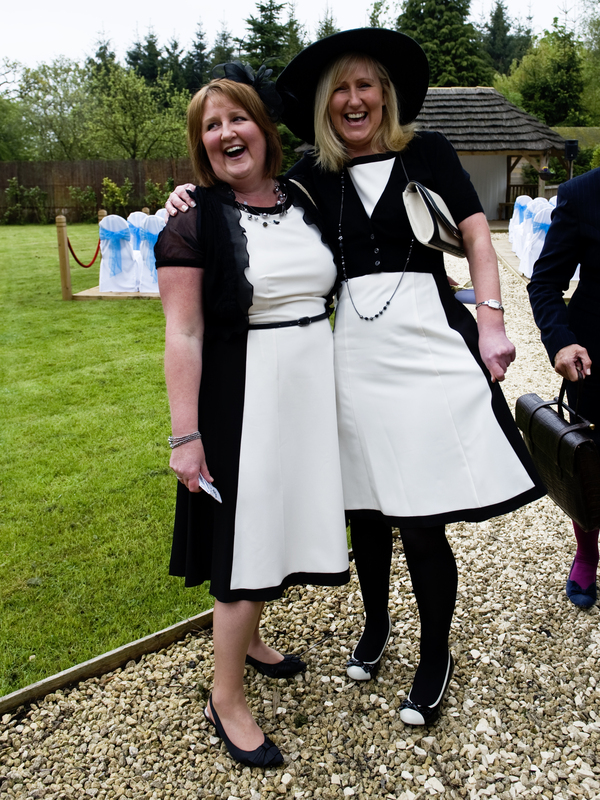 …Two Women, in the same dress! The accessories were completely different, but the dress, the same! I just had to take a picture of these two lovely ladies who seemed utterly mortified at this coincidence. I then struggled to contain my giggles when I discovered, they were sisters! Fantastic! The rest of the day was perfect. The speeches were short, sweet and witty. The sit down buffet was just enough to satisfy and the drinks were flowing freely at the bar. …Sisters, wearing the same dress!